Grab a cup of coffee or a cocktail, depending on the time of day you are reading this, put your feet up and be prepared to be inspired. Yes, it is that time. It is Motivated Monday. There were so many terrific projects and ideas submitted this week. I can't feature them all but I wish I could. It is always hard to decide and you might have chosen different posts because we all like different things at different times but these are just a few ( okay more than a few) of the posts that grabbed me. Blam. This stole my BeColorful heart. I think this is where the phrase "bolt from the blue" came from. shared her classed up chevron curb- side find. Love those colors and with a great tutorial this is a project that you could easily take on too. I am a sucker for phone cases. I have at least three now. I like to think of them as outfits for my phone. Don't you love the one Jessica made? If you are looking for a new treatment for your walls or to class up a piece of furniture then this glazed burlap idea via Studio of Decorative Arts may be the answer you are looking for. We have all seen a lot of subway art lately but I liked this fresh approach to the masking technique. Feral Turtle took this tried and true look and dialed it up a notch by creating hers on fabric! Very cool. Then there were the sewing projects. Why didn't I ever really learn how to do this??? I had loved the curtains that DIY Design had made for her guest bedroom a while back but I am equally enamoured with this coordinating embroidered bolster pillow cover that she featured this week. Then there was this really terrific sun suit that was linked up. I knew when I saw the word vintage under Urban Moppet's thumbnail that I was going to love her project and I was so right. How awesome is this darling vintage pattern sun suit? So very Tot Chic. I think people would pay big $$$ for these. When it came to furniture updates I really liked this Ikea hack idea that Turtles and Tails gave to her dining set Ikea chairs with a bit of jute twine. Herringbone Lane, has a sophisticated glam edge to it. With the mirror? ... I die. Another great furniture renaissance came from Do It Myself. Not only the piece itself but the colors of this fancifully painted "B'faye" as she titled it, make me think of a vintage 1940's kitchen. Such fun. For a blog named BeColorful you knew this had to be one of the features this week. Door Candy is another fetish of mine. 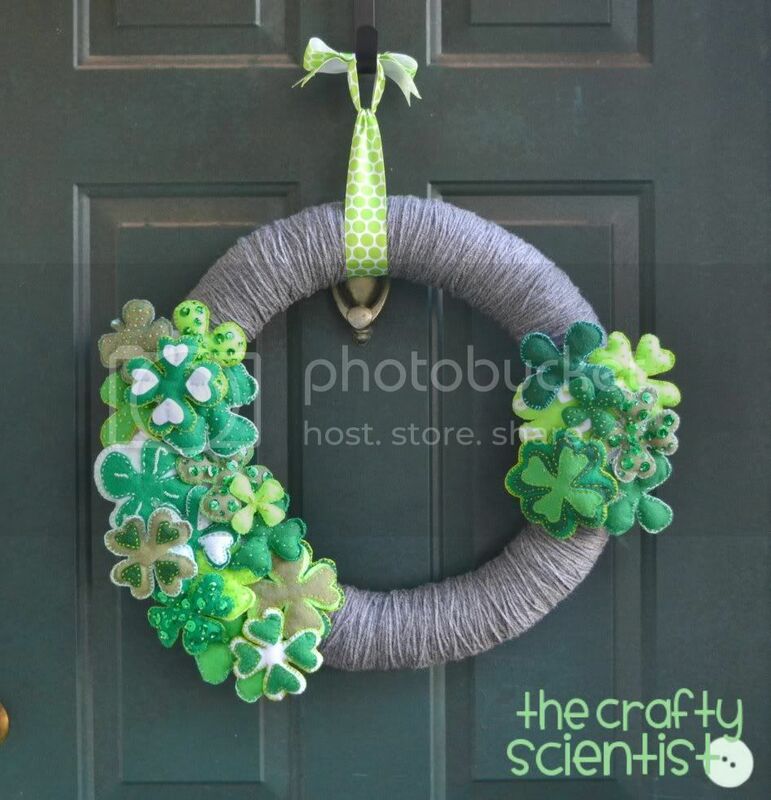 I know I have featured at least one of The Crafty Scientist's wreaths before but I had to share this one too because I think it is genius that she designed it so that the embellishments can be switched out. Just think about it. You could have one wreath and just change it up for the seasons and holidays. No more having to store multiple wreaths. Gotta love that idea. Finally there was this delightful post from Note Songs that gives us a peek at the wall painting she did in her granddaughter's room. So sweet. Stop by her post to see how she personalized this. I obviously had a tough time editing myself this week.